It seems like every time I visit New Bern, I either plan to visit Havelock or run into someone that says, “You should go to Havelock.” Well, I finally did it. And, I now know what I have been missing. The town is just a short, easy drive from New Bern. It took me less than 20 minutes. Top of the day’s agenda was to visit the Havelock Visitor’s Center, where there is a very interesting aviation exhibit. I had no idea of the depth of heritage and culture here. There are some truly unique displays of the history of marine aviation in Eastern Carolina. And, it is interesting that Havelock is not too far from the home of aviation, Kitty Hawk! The Havelock 9/11 Memorial Plaza is a striking setting for a place of remembrance of those who paid the greatest sacrifice. Next up was to experience the town’s 9/11 Memorial Plaza. From a local resident, I learned that on the tenth anniversary of the tragic attack, the artifact piece at the center of the plaza was unveiled. 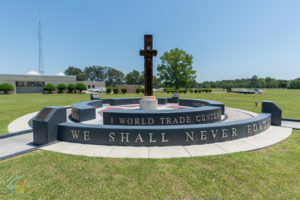 The monument includes a few other pieces from the World Trade Center, and it names each of the sites affected that day. If you are driving through Havelock, the Memorial Plaza is worth the stop. Of course, Havelock is most known for being home to one of the largest Marine Corps Air Stations in the world, Marine Corps Air Station Cherry Point. I did not have the opportunity to tour the base (you need a pass of course). Yet, I still felt a sense of patriotism and pride knowing the incredible efforts being conducted inside. It was time to finish up my visit, and what better way to do so than enjoy a delicious American meal. A New Bern friend recommended Ziggy’s Café. While the exterior leaves a lot to be desired, do not judge an eatery by its outside. The burger and fries were the perfect salute to a great day. I finally took the time to visit Havelock. As a result, I was reminded how fortunate we are to live in America. And, to be able to visit New Bern and its surrounding areas often!